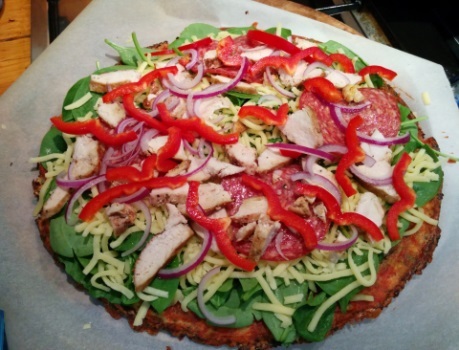 There are many recipes out there for Cauliflower Crust Pizza. I chose to use one which I had found on http://onelittleproject.com/cauliflower-pizza-crust/ then tweaked it some. The first step was to process the Caulifower. I am lazy, let’s get that straight. If there is an easy way to do something I will do it! 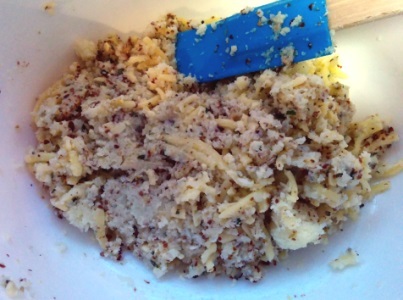 Having established this, I will share how I rice my cauliflower for minimum mess. I cut the pieces up and then toss them in my blender with water and then pulse. 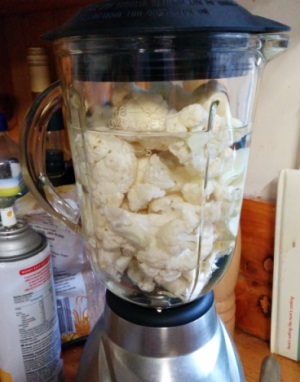 The water helps to keep the cauliflower moving around so it’s not becoming mushy at the bottom and still chunky at the top. Just drain in a colander and voila! I measured 2 cups worth of riced cauliflower (and put the rest in the freezer!) then nuked the 2 cups of cauliflower in the microwave for 4 minutes then allowed it to cool. After squeezing out excess moisture I added the egg, 1 cup of cheese and 1/4 cup flax meal and mixed. Then I just patted the mix onto a pizza stone, baked till golden on top then flipped it over and cooked the base a little * Note: Let it cool some! IT’S HOT! Also make sure to use no stick parchment paper or to spray the paper with olive oil or it will stick. Onto the toppings! Being that I am on a budget and I try to use what I have at home rather than running out to the market every day I was forced to use what was in the fridge. That is.. a piece of cooked chicken breast, salami, spinach, red onion and capsicum and mozzarella.